Over the last several years, I have become an ultralight camper with a three-season base pack weight of about 8 lb (3.5 kg) and skin out weight of 17 lb (8 kg). I have completed many section hikes on the Appalachian Trail (AT) in all four seasons, and many trips to state parks, with a total mileage of about 1650 miles (2500 km). I am a gearhead, a hammock or tarp camper, and I make much of my own equipment. The Zip Away Dry Stuff Sack is a lightweight waterproof stuff sack that closes with a roll top closure. The sewn seams are taped on the inside. The bottom of the sack has a second compartment closed with a non-waterproof zipper. The stuff sack can be reversed and the sack stored in the bottom compartment. When not in storage mode, the bottom compartment can be used to store an item which does not need to be kept in a waterproof compartment. When the stuff sack arrived at my home it was exactly as described on the website and was just what I had expected. The size (5 liter) was precisely what I needed to store a number of electronic devices for backpacking, so that I could avoid making my entire pack waterproof. I have used a "waterproof safe" in my backpack for a number of years. Not trusting either the pack or a liner to keep everything dry, I have kept those items that can not get wet inside an absolutely waterproof sack in the top of my pack. 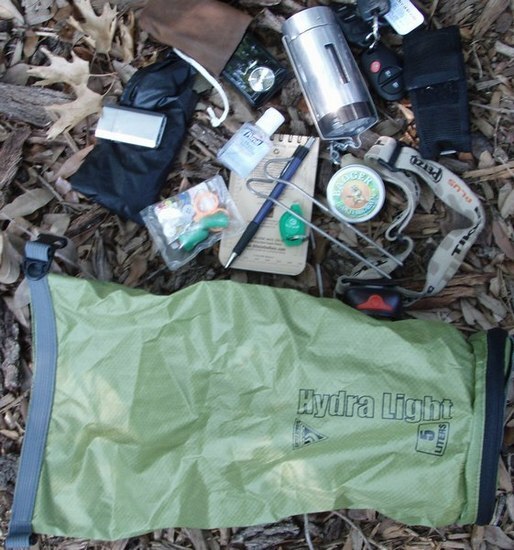 That waterproof sack has also become the place I keep most loose items in the pack - from lights to cell phone and keys. I have recently been encouraged by a fellow hiker to think about a pack as a bag that keeps equipment together and out of the direct rain, but which is never assumed to be waterproof. As I am exploring this kind packing, I have simultaneously wanted to reduce the weight of my "waterproof safe". 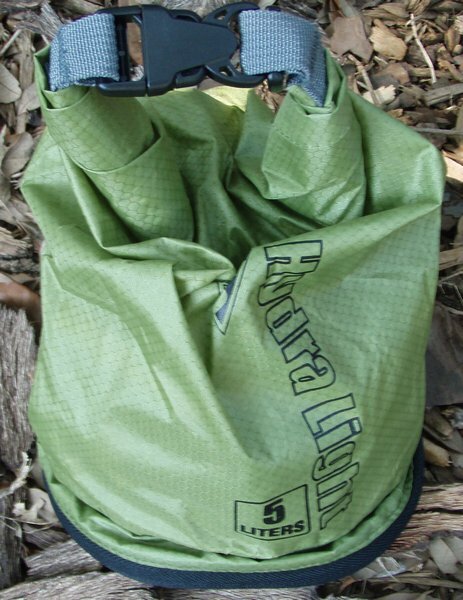 The HydraLight sack is about half the weight of the item I have been using for the last 1000 miles of hiking. As I think about it, it might have been nice not to have carried that excess weight up and down all those hills. I inspected the sack and it appears to be very well made, of lightweight waterproof cloth. The roll top closure seems secure. By rolling over and over and then locking that roll into place, there is no way that I can imagine that rain could enter the sack. The closure does not supply a pneumatic seal. When I have put gear into the sack and then squeeze, air slowly leaks out the roll closure. This is good in backpacking, because my pack will not need to enclose an unnecessary volume of packed air. The inside surface of the stuff sack's seams have been neatly taped to maximize the waterproof nature of the sack. I did try to stuff my sleeping bag into the sack, just to see if this might be a possibility for testing. The sack is not quite big enough for that purpose, but a 10 liter version of the sack may be another possibility for further waterproof packing options. I am interested in exploring uses for the zip-close bottom compartment. of the sack. Maybe an item like a small poncho or a headlamp (which does not need to be kept in an absolutely waterproof container) can be put in that area to make it very easy to find in the dark. The Zip Away stuff sack appears to be a lightweight alternative for keeping items waterproof in a pack. - I am interested in finding a clever use for the zip closure bottom compartment of the stuff sack. I thank Seattle Sports and BackpackGearTest.org for selecting me for this test. 21 November 2008 – Overnight at Government Canyon. Cloudy night was expected to be cold. I slept in a tarp tent, and the temperature only dropped to 50 F (10 C). 25 October 2008 – Overnight at Government Canyon. Hammock camping. Temperature 50 to 80 F (10 to 27 C) Clear night with many stars visible. Testing sack, pack, and light. In addition to the overnight trips mentioned, I have carried the dry sack on a number of day hikes and overnight trips for business. If anyone can arrange for some rain in southern Texas, I will be glad to test the sack in the rain! This dry bag is the right size for carrying loose items in my pack that need to stay dry. It has worked out very well, except that I have not been comfortable carrying sharp tent stakes in the bag. I don't want to risk poking a hole in the bag, and don't have a good way to cover the ends of the stakes. All the rest of the gear works out very well. In addition to the gear pictured, I have carried insect repellent and a small flute in the bag. While nothing has gotten wet in our dry fall, the bag does seem to be very resistant to even air passing through its roll up closure. I routinely need to deflate the bag before rolling up the top of the bag. The bag has not stayed completely waterproof. I put a cotton pair of shorts in the stuff sac and put that out in the rain in a shallow puddle of water in a folding chair. After a half hour of sitting in the rain and puddle, there were several small wet spots on the shorts. Next, I filled the bag 2/3 full of water. There were 30-40 places where a small drop of water squeezed out through the fabric. Along the sewn seam at the bottom of the stuff sack, there were many other places where water beaded up as it slowly leaked out of the bag. These results are disappointing, as the main reason that I carry a waterproof bag is to have an absolutely safe place for sensitive electronics. Another (thicker) bag from Seattle Sports has never leaked at all in my pack, even though I have been using it for a number of years. So I am now considering the Zip Away! 5 L Dry Stuff Sack as a place to keep items "relatively" dry. It still has many uses at that level, mainly in keeping clothing dry. I think that I am going to spend a night thinking about how to use the bottom, non-waterproof, zippered pouch on the bag. As a start, here is some brain storming: I could use it to hold my signal mirror, or my fire starter. I could use it for ceremonial tobacco. I could carry a lighter in the small space, or a pair of waterproof leggings. I could keep my sewing kit in the pouch, as I almost never need it, or a small bottle of soap. I could even put a small LED light in the pouch so that I would not need to dig through the rest of the stuff to find the tool I need to see in the bag at night. Lightweight, easy to pack, easy to use. This bag is not completely waterproof after a two month period of use. Counting the overnight trips below, I have used this dry sack for five camping trips, as well as about 12 long day hikes. 20 December 2008 – Night at South Llano River State Park, Junction Texas. Hammock camping. Low of about 45 F (7 C). A beautiful clear night with lots of astronomy accomplished. 23 January 2009 – Garner State Park Texas. Testing gear and doing astronomy at this dark sky site. Tested the gear in cold windy conditions. Low of 30 F (-1 C). 30 January 2009 – Cat’s Meow Star Field, Fredericksburg, TX. Cold night doing astronomy in the Texas hill country. Clear skies, temperature about 27 F (-3 C). In addition to the overnight trips mentioned, I have carried the dry sack on about 5 day hikes of over 6 miles. During this testing period, I have used the stuff sack to carry extra clothing on my overnight trips. I have put my rain gear, socks, a balaclava I wear at night, and an extra shirt in the bag. Unfortunately, it has not rained more than a tenth of an inch during the entire long term testing period. The bag's seams have stayed together with no separation. The zipper bottom is as good as new. The roll top closure and the clips that close it are still completely functional. The fabric has not "pilled" or worn thin. It has not been punctured by items in the pack. When I roll close the bag, it still seems to be mostly air tight. I performed no further testing of the waterproofness, as the bag had failed at this test two months ago. Lightweight, easy to pack, easy to use. It is a very good bag to keep items in which should remain mostly dry. This bag is a great place to keep clothing for a dry change after a wet day. The stuff sack is not completely waterproof. It is not appropriate to store items (such as electronics) which must be kept dry at all times. I thank Seattle Sports and BackpackGearTest.org for giving me the opportunity to test this stuff sack.